I reach out with my abilities - nothing more than a searching stroke through the air - and I sense that they're connected. A web of power links each soldier into a cohesive unit. The long-awaited final book in the Falconer trilogy is an imaginative tour-de-force that will thrill fans of the series. Aileana Kameron, resurrected by ancient fae magic, returns to the world she once knew with no memory of her past and with dangerous powers she struggles to control. Desperate to break the curse that pits two factions of the fae against each other in a struggle that will decide the fate of the human and fae worlds, her only hope is hidden in an ancient book guarded by the legendary Morrigan, a faery of immense power and cruelty. To save the world and the people she loves, Aileana must learn to harness her dark new powers even as they are slowly destroying her. 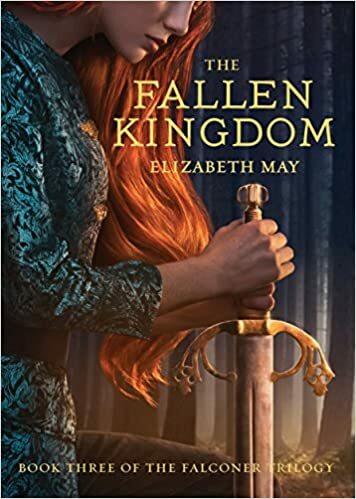 Packed with immersive detail, action, romance, and fae lore, and publishing simultaneously in the UK, The Fallen Kingdom brings the Falconer's story to an epic and unforgettable conclusion. I like a good fantasy and I really love this cover! I'm wondering if their connection is a good thing or bad. Sounds like an action packed finale. Nice teaser! Never did read this series but always love the covers! !